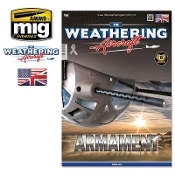 In this issue, world-class modelers finish all types of weapons with a multitude of techniques such as washing and paneling, and the use of Oilbrushers and pigments. The authors also explore in detail, how to integrate the weapons that accompany each subject so that they have the same degree of wear or different weathering in those cases that require it. TWA covers all time periods and armament types ranging from a machine gun mounted on a World War I airframe to modern cruise missiles, including both air-to-air and ground attack weapons. As always, TWA features the best collaborators, each providing you with inspiration and new techniques for your next project.